We devote all our resources to getting the best possible result. Contact us today to start your FREE case evaluation. Lawrence & Associates > Blog > Bankruptcy > How Can I Stop My Car From Getting Repossessed? How Can I Stop My Car From Getting Repossessed? A car is a necessity in modern life. We need to go to work, school, and home, and few of us live in walking distance. Therefore, the prospect of a car’s repossession is frightening. Once you finance or lease a car, your car lender has certain rights and remedies that come with the contract you sign. One remedy allows the lender to repossess your car if you default under the terms of your agreement. Your contract will specify what exactly constitutes a default but common examples include failing to make your payments or not having car insurance. Although many car owners assume they have grace period before repossession begins, the contract usually allows for repossession at the time of default. Some Northern Kentucky car lots, such as Limited Motors, report that they offer at least a three week grace period to car owners in default before repossession begins. However, often car lots will not guarantee a grace period and choose to exercise their repossession right quickly. What Steps Should You Take If You Default on Your Loan? 1. Keeping the car in a garage. 2. Parking the car a distance away from your house and place of work, where it will not easily be found. 3. Parking the car in your backyard, where it cannot be seen from the road. 4. Asking a neighbor or friend to keep the car at their home, under a tarp or other cover. Under any of these scenarios, you make it less likely that a repossession will occur because you prevent the repo man from finding or accessing the vehicle. A bankruptcy can help you to stop the repossession and even get your car back after repossession. When you file bankruptcy, the automatic stay goes into effect, which forces your creditors to cease all collection attempts against you. This means that your creditors cannot call you, continue with a lawsuit, repossess, sell, or foreclose on your property. With a few exceptions, you are completely protected by the bankruptcy and creditors must seek court permission before continuing their collection efforts. If you are facing a repossession, you must choose a Chapter 13 bankruptcy in order to save the car. Your best bet is to file bankruptcy before the car is repossessed – if you do so, Lawrence & Associates can print a proof of bankruptcy filing for you that will prevent the repo man from taking your vehicle. Even if the car has been repossessed, you can get the car back if you file a Chapter 13 bankruptcy before the car is sold at auction. However, the timing of the auction is always in flux, so it can sometimes be difficult to get a bankruptcy filed and get notice to the lender before the auction occurs. Do you think your lender may try to take your car soon and you cannot afford to get caught up on your car payments? A bankruptcy may be your best option to stop repossession. Call Lawrence & Associates today! We’re Working Hard for the Working Class, and we can help you! A man was injured when a piece of construction equipment collided with his vehicle and crushed him. A man was working on a motor vehicle when a truck struck the vehicle. The man was pinned between the two vehicles, and his hips and legs were broken. A man was changing a tire on an Ohio road when he was negligently struck by another vehicle, resulting in life threatening injuries. A woman was killed while driving due to spillage left on the road. A man developed a rare nerve condition due to his employment, which made it impossible for him to use one arm. A man was a passenger in a rental car when it spun out of control and killed him. 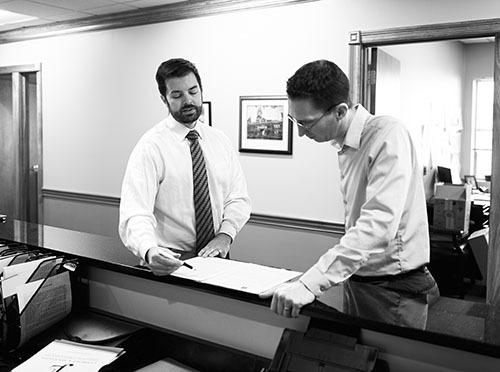 request a consultation and our team will prompty review your case. Copyright © 2019, Lawrence & Associates. All Rights Reserved.